Today is Primary Election Day – VOTE Today! Today, is Primary Election Day in Arizona. Nominees from both the Democrat and Republican parties will be chosen to move on to the General Election in November 8th. There are several high profile races to follow today. Senator John McCain is facing a Republican challenge from conservative State Senator Kelli Ward. The winner of that race will take on Congresswoman Ann Kirkpatrick who is hoping for a promotion to the US Senate. In Congressional District One, a handful of Republicans are squaring off for the nomination. Pinal County Sheriff Paul Babeu, Lt Col (ret.) Wendy Rogers, former Secretary of State Ken Bennett, Eastern Arizona Rancher Gary Kiehne and Native American Shawn Redd will likely take on former state legislator Tom O’Halleran in the General Election. The winner of the Republican Primary in CD-5, is guaranteed to be the next Representative from this East Valley district. Conservative business leader Christine Jones, is challenging three current and former officeholders in this race. Senator Andy Biggs, Representative Justin Olson and former County Supervisor Don Stapley are in the running against Jones. Arizona’s Forth Congressional District also has a Primary contest as current Congressman Paul Gosar is being challenged by Buckeye Councilman Ray Strauss. Whoever wins that contest will be the next Congressman from CD-4. The only other statewide race taking place is for three seats on the Arizona Corporation Commission. In that contest former State Senator Al Melvin and current State Senator Rick Gray are hoping to earn nominations as current Commissioners Andy Biggs and Bob Burns look to win a slot for the General Election. Former Chandler Mayor and Judge Boyd Dunn is looking to edge win a seat on the contest. All told, five Republicans are running for three seats. Whoever wins the GOP nod will move on to the General against Democrats, former legislator Tom Chabin and former ACC Commissioner, Bill Mundell. If you plan on voting today, remember that polling places will close at 7 PM sharp. Turnout is expected to run 25-35% with most votes already cast via early ballots. 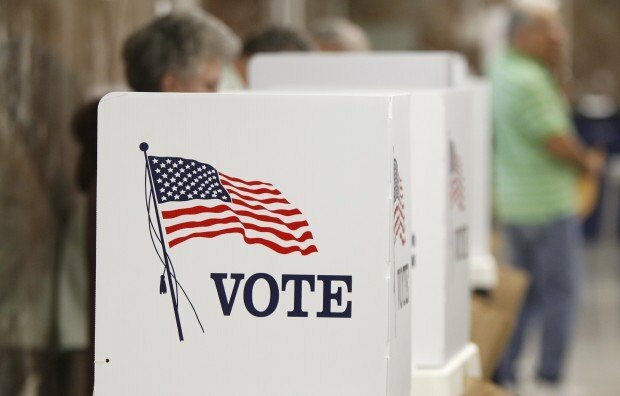 Be the first to comment on "Today is Primary Election Day – VOTE Today!"